Pool World has been in business since 1976 with a store in Coeur d'Alene since April of 2004. The store was relocated earlier this year to a new location at 745 W Appleway Ave. In 2016, the company purchased raw land and built a new 13,500 square foot multi-tenant retail center. 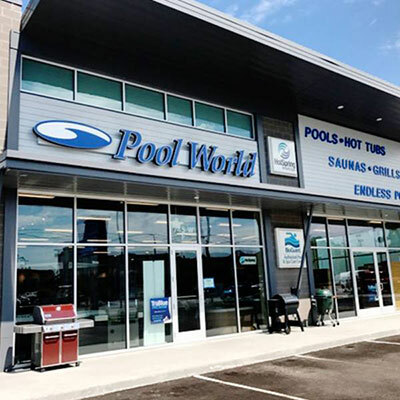 This new, larger location provided the opportunity for Pool World the ability to expand and modernize its Coeur d'Alene store, allowing better display and selection of its full line of hot tubs (Hot Spring, Caldera, and Free Flow hot tubs), Finnleo Saunas, barbecues (Big Green Egg, Traeger, Weber) and swimming pool products. This new Pool World location will use about 7,000 square feet of the building for its retail store. The remaining of the building, about 6,400 square feet is available for lease in segments as small as 1,000 square feet. The west wall of the building has a drive thru. This Saturday, August 26, Pool World celebrate their new store with a grand opening from 9-5pm. There will be great savings on Hot Tubs, Barbecues, Saunas, Endless Pool Fitness Systems, and much more. BioGuard, Big Green Egg, Booey's, Silk Balance and a variety of other representatives will be on site. There will be fun giveaways and a grand door prize. The ceremony will be starting at 11am. Pool World stores are located in Spokane Valley between Target and Shopko, east Sprague next to Big 5, the North Division Y and in Coeur d'Alene next to Lowes. The website is www.poolworld.biz.